We’d love your help. 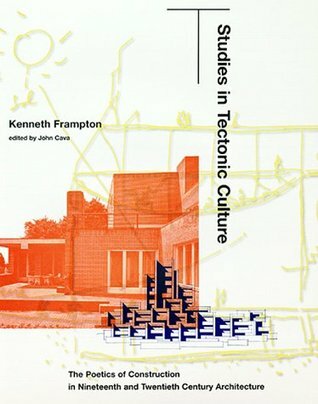 Let us know what’s wrong with this preview of Studies in Tectonic Culture by Kenneth Frampton. "Kenneth Frampton's book [new book] approaches a very important issue for understanding the way in which architects proceed: the continuity between form and construction. But to establish this continuity doesn't simply mean to accept pure constructive determinism, and Frampton's book helps us to comprehend that beside whatever technical discovery there is always the architect's effort to produce form. Using the work of outstanding contemporary architects such as Utzon and Scarpa, Frampton is able to show how architectural talent is manifested in continuous form invention." -- Rafael Moneo, Professor of Architecture, Harvard University "The material, detail and structure of a building is an absolute condition. Architecture's potential is to deliver authentic meanings in what we see, touch and smell; the tectonic is ultimately central to what we feel. .... Kenneth Frampton's new book is important for architects, students and anyone interested in the secrets of architecture." -- Steven Holl, Architect Kenneth Frampton's long-awaited follow-up to his classic A Critical History of Modern Architecture is certain to influence any future debate on the evolution of modern architecture. To ask other readers questions about Studies in Tectonic Culture, please sign up. A mandatory re-read every 5-10 years. Kenneth Frampton is a British architect, critic, historian and the Ware Professor of Architecture at the Graduate School of Architecture, Planning, and Preservation at Columbia University, New York. Frampton studied architecture at Guildford School of Art and the Architectural Association School of Architecture, London. Subsequently he worked in Israel, with Middlesex County Council and Douglas Ste Kenneth Frampton is a British architect, critic, historian and the Ware Professor of Architecture at the Graduate School of Architecture, Planning, and Preservation at Columbia University, New York. Frampton studied architecture at Guildford School of Art and the Architectural Association School of Architecture, London. Subsequently he worked in Israel, with Middlesex County Council and Douglas Stephen and Partners (1961–66), during which time he was also a visiting tutor at the Royal College of Art (1961–64), tutor at the Architectural Association (1961–63) and Technical Editor of the journal Architectural Design (AD) (1962–65). Frampton has also taught at Princeton University (1966–71) and the Bartlett School of Architecture, London, (1980). He has been a member of the faculty at Columbia University since 1972, and that same year he became a fellow of the Institute for Architecture and Urban Studies in New York -- (whose members also included Peter Eisenman, Manfredo Tafuri and Rem Koolhaas) -- and a co-founding editor of its magazine Oppositions. Frampton is a permanent resident of the USA. Frampton is well known for his writing on twentieth-century architecture. His books include Modern Architecture: A Critical History (1980; revised 1985, 1992 and 2007) and Studies in Tectonic Culture (1995). Frampton achieved great prominence (and influence) in architectural education with his essay "Towards a Critical Regionalism" (1983) — though the term had already been coined by Alexander Tzonis and Liliane Lefaivre. Also, Frampton's essay was included in a book The Anti-Aesthetic. Essays on Postmodern Culture, edited by Hal Foster, though Frampton is critical of postmodernism. Frampton's own position attempts to defend a version of modernism that looks to either critical regionalism or a 'momentary' understanding of the autonomy of architectural practice in terms of its own concerns with form and tectonics which cannot be reduced to economics (whilst conversely retaining a Leftist viewpoint regarding the social responsibility of architecture).